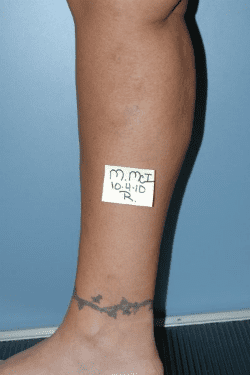 Ambulatory phlebectomy, or mini-phlebectomy, is a very effective minimally-invasive method of removing small and medium-size varicose veins through micropunctures using special surgical hooks to extract the veins in small segments. It is done under local anesthesia and our patients have an elastic leg wrap on for two days following the procedure. There is usually no “down time” and full activity can be resumed the same day. The micropuncture incisions do not require sutures, so there is no need for any follow-up removal later on. Mini phlebectomy is a great advance over earlier methods of removing the offending veins, which typically required an in-hospital procedure under general anesthesia, large incisions, significant blood loss, and associated “down time” from normal activity, work and play. Our phlebectomy technique also avoids the unsightly scars that resulted from those larger incisions required to remove the vein by older “open” surgical methods. 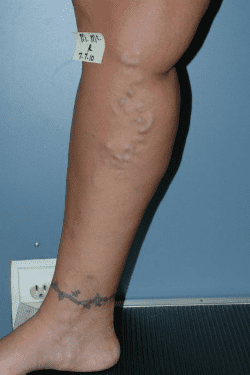 Phlebectomies are used for secondary varicose veins – the raised, bulging veins that are too tortuous to get the laser fiber through, and veins too big to be closed down with sclerotherapy.